Time to meet up for another InterNations gathering! 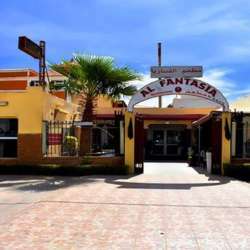 This month's event will be held at Al Fantasia restaurant, located on Moktar Ould Daddah Road between Cafe Savana and Carrefour Citismar. It offers a nice menu with a relaxing outside atmosphere. Our gathering will be set up outside under the tent in the courtyard of the restaurant. I hope everyone can come out and join us for another great gathering! *Note - This is a free event to attend. Those of you who do order food or drinks are obligated to pay for them. Please be sure to pay your bill before you leave. Thank You! Come on out to catch up with old friends and meet new ones in Nouakchott! As always, we welcome your friends to sign up and join us too! If you plan to bring guests please let me know before the event so I can plan accordingly. I look forward to seeing you all!